Completed another piece this morning, having experimented in yet another direction. I'm appreciating how this series is hanging together well, even though each piece explores a different style or idea. 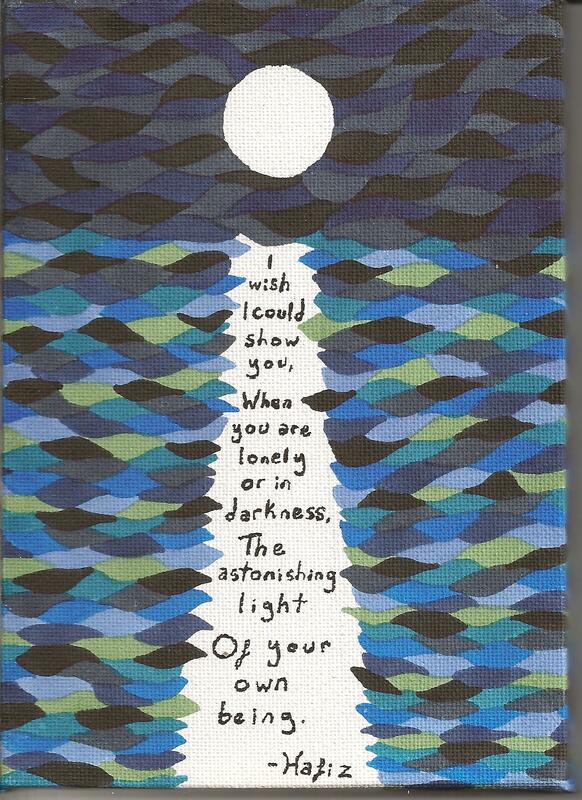 This one, 'I wish', contains my favourite poem by my favourite poet. It would take me a week to boil down to my top ten poems, but this is clearly number one for me. I recommend I Heard God Laughing to everyone. This is my favourite poem because it so perfectly expresses my intention. Much of what I do is moving towards this. I believe we are perfect. And if only we had the faith to believe that, we would behave like it. My own winding animist/mystic path runs nice parallels to the Sufi ideas of Allah in everyone; in everything. All of which makes me sound very saintly to ears which are accustomed to hearing 'perfect' as a long list of what it is not. The more I think about perfection, the less I can exclude from it. My daughter teaches me about this. She is indisputably perfect (at least, I strongly recommend not disputing it in my hearing!) and this is not changed when she learns she can draw on the wall with her toothbrush, or that I make an entertaining noise when she pokes me in the eye. Just perfect, with lots to learn. Like the rest of us. How about you? Are you perfect? Thank you Rachel. The more I feel I've shown myself in a post, the greater the urge to delete it. This one nearly didn't survive, so encouragement is appreciated :o). Beautiful Lunar. And it's something I'm constantly trying to tell myself, but of course, the old feelings of inadequacy or lack of confidence still make their presence known. I'm very drawn to the Japanese notion of Wabi Sabi, perfection in imperfection/incompletion (I'm still trying to work it into my artwork though, the perfectionist is still there). So many of the things I'm attracted to are a bit wonky, not quite 'perfect', not quite 'beautiful'...and yet they are perfect, in a much richer and more beautiful way than something that has no flaws. Slightly off tangent, (but still kinda on track! ), I've always found the idea of 'heaven' leaves me cold...that people can spend their whole lives looking skyward to some perfect realm. I've always felt that paradise is right here beneath our feet, if only we'd learn to look down and see her! As Leonard Cohen says...there's a crack in everything, that's how the light gets in! Ah, Christina, yes, exactly, thank you. And I wouldn't presume to argue with Mr. Cohen. :o). This is so beautiful!!!! Really. I love it. What talent you have. My yoga teacher mentioned the word imperfect the other day. i. m. perfect. Thanks MSB. i.m.perfect - I'll remember that :o).